Born in 1949, who is he and what has he done over all these years? He has…run from grizzly bears in Alaska; hiked in the rain forests of Central America; been loved for 40 years by his understanding wife; built three houses; fished in the South China Sea; been raised in a family of 8 kids with only one bathroom; served as a medic in Vietnam; installed hardwood floors; loved to sail but gets seasick; fathered two remarkable children; completed a four year science degree in three years; delighted in cooking and kitchens; held blue and precious newborns while assisting in C-sections; been raised without a television; served as an altar boy; killed and gutted a deer; had a fear of heights; read books voraciously all his life; steered a brakeless, smoking semi-truck down a two mile hill in Alaska to safety; given mouth-to-mouth to a dying Vietnamese napalmed infant; always been fearful of snakes; operated a D-9 Caterpillar on the North Slope; set chokers; almost drowned in the whitewater of the upper Klamath River…and he has never broken a bone, lost his wallet or spent the night in jail. His favorite activities are golf, reading, tile and rock projects, international travel to large cities, cooking, growing cucumbers and tomatoes, making pickles, and studying political theory and the lessons of history. 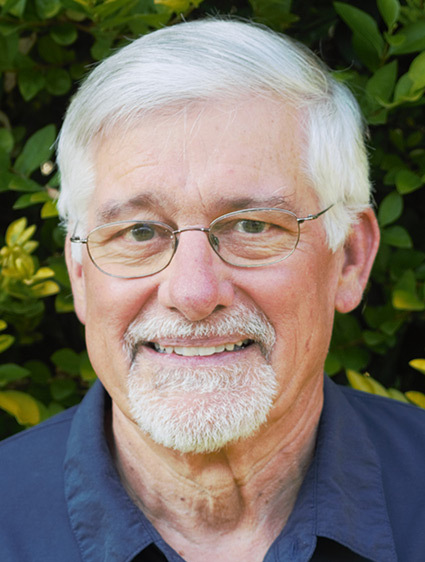 His wife, Carol, is a retired administrative faculty at SOU serving as director of pre-College Youth Programs. Jensen has deep roots in Ashland. He moved here in 1972 and his wife, Carol, was born here. He and Carol live in a house that he helped his father-in-law build 35 years ago. It has four bathrooms! He wants to contribute to municipal governance using his experience in construction, building supply management, and teaching, where he taught physical and earth sciences and American history at South Medford High School. Serving on the Ashland Forest Lands Commission, he was one of the principal editors of the nationally recognized 2016 Ashland Forest Plan. He is currently a primary editor of the developing 2018 Ashland Trails Master Plan. He also serves as a district coordinator for the Ashland Food Project and is the director of the SOU Regional Brain Bowl Tournament. Housing Affordability: It’s an issue of supply and demand. We must increase housing supply with creative in-fill and red-tape reduction while preserving what makes our community special. Homelessness: We need to pair compassion with safe and respectful use of our public spaces. Economic Development: Encourage family wage jobs with bold, creative planning by expediting Croman Mill, Transit Triangle, and Clear Creek projects. Budget: We have capable financial management and improved transparency. We need constructive dialogue leading to smart, balanced choices.